I'm not much of an animal person. 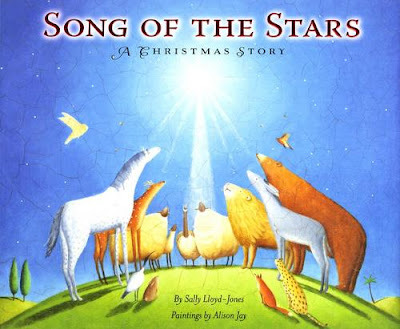 But I love "Song of the Stars" by Sally Lloyd-Jones. The book features all kinds of animals and parts of nature celebrating the coming birth of Jesus. I'm certain my kids and their friends will love it too. We're going to read it at a Jesus birthday party we're having with friends this coming weekend. The illustrations by Alison Jay are beautiful and draw readers into a story that is beautifully told. Jesus' birth changed the entire world, and this is a sweet perspective for little hearts. has come to live with us!" I like the other ways Jesus is described in Sally Lloyd-Jones' pages: The Might King! The Prince of Peace! The Bright and Morning Star! The Good Shepherd! A Light to light up the whole world! Our Rescuer! God's greatest gift. A tiny little baby. Heaven's son sleeping under the stars that he made. It's time! It's time! ... Get ready! Get ready! Be glad! Be glad!